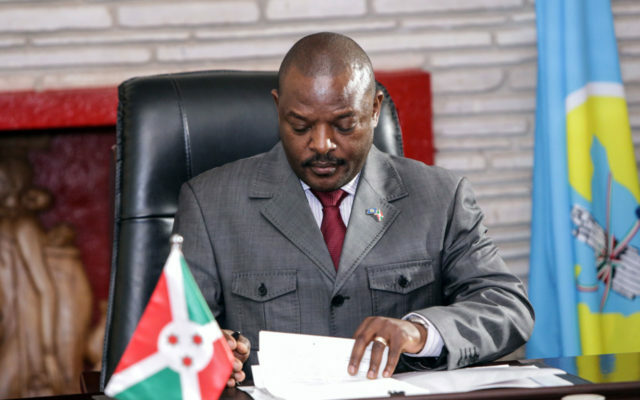 “History is being written in the centre of the country at Gitega, the head of state Pierre Nkurunziza has just put his signature to the new constitution of Burundi,” the official presidential Twitter account announced at 10:30 am (0830 GMT). The constitution, approved on May 17 by a majority of voters around the densely-populated central African country, will allow Nkurunziza to run for office twice more in seven-year terms from 2020. The former rebel leader first came to power in 2005 after a bloody civil war between ethnic Tutsis and Hutus. He was scheduled on Thursday to go to Bugendana in Gitega province to present the new constitution “to the Burundian people”, his aides announced. The text, challenged in vain by an opposition coalition before the constitutional court, concentrates more executive power in the hands of the president, a Hutu self-proclaimed born-again Christian said to believe he rules Burundi by divine right. On social media, many opponents of the regime denounced Nkurunziza’s choice of Bugendana. The site, said some, symbolised crimes carried out by the former rebel National Committee for the Defence of Democracy-Forces for the Defence of Democracy (CNDD-FDD) — today Nkurunziza’s political party. In July 1996, at the height of the civil war that pit Hutu rebels against an army then dominated by the Tutsi minority, more than 600 Tutsis were massacred at a displaced persons’ camp at Bugendana. “This has nothing to do with the civil war,” the source maintained. Opposition parties argue that the new constitution is a death knell for a peace treaty negotiated in the Tanzanian town of Arusha and signed in 2000. That deal opened the way to an end to the 1993-2006 Burundian war, which claimed around 300,000 lives. The Arusha Accords notably provided for equitable power sharing among ethnic groups in political institutions, steps to integrate former rebels into the armed forces, and constitutional checks to prevent a concentration of power. The current political crisis began three years ago when Nkurunziza ran for a third term and won a disputed election. It has claimed at least 1,200 lives, while more than 400,000 people have fled their homes, according to the International Criminal Court (ICC), which has begun an investigation.